Whatever your goals, challenge yourself and shape your best life! Everyone's fitness journey is different. That's why this challenge is less about distance and more about commitment. 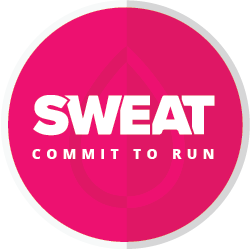 Get sweaty to earn your digital badge! For the first time ever, the health and fitness app, Sweat, is offering exclusive one month free app access - including guided workouts, meal plans, motivation tips and fitness education. Join the challenge, then download your one month's free membership to the Sweat app to complement your challenge runs. Then lace up your running shoes! To complete the challenge on Strava, run a total of one hour over the course of the week and earn your Sweat digital badge. You can even break the time down into smaller runs that fit your schedule. Just like the workouts in the Sweat app, you can start anywhere and train when it suits you! Sign up to get running and shape your best life! Join this challenge and get one month of free and exclusive Sweat app access. Complete the challenge to earn a digital badge! The content in this challenge is the sole expression of sweat.com. To learn more about how to use Strava, please visit the Strava Support Center or email support@strava.com. All other inquiries should be directed to the sweat.com Support Center.